Rugby for all at The Fry Group 7s and Touch Tournament. The SCC Rugby Academy 7s has become a popular fixture in the junior rugby calendar in the last few years and a parent puller for main SCC7s event. This year tournament, mainly run on the weekend before the main SCC7s, saw 285 games of rugby and touch played, involved a total of 131 teams and 1,834 children – surely some kind of record on the Padang? 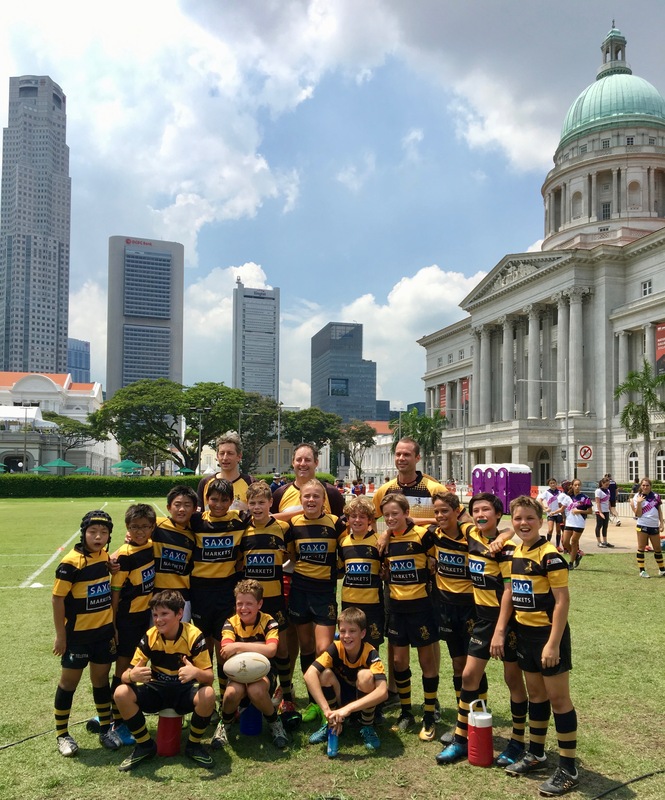 We are the only Singapore junior rugby club to host a tournament offering both a touch and rugby competition rolled into one weekend and the historic setting of the Padang was not lost even on the youngest of our players (U5). The junior cup finals were played during a break in the SCC7s competition, with some animated support from the crowd. This year, the SCC Rugby Academy achieved some of our best results, with four teams lifting the cup, while many others were runners up, plate winners and our Touch teams performed magnificently. This years tournament also saw the first ever all girls Singapore-based teams, The Valkyries, compete in the main rugby competition in three age groups. The success of the Academy’s 7s tournament is a testament to the hard work of the organisers and volunteers. For anyone who hasn’t come across the SCC Rugby Academy (where have you been? ), we are a junior rugby club offering a top quality rugby and touch experience from the age of three to 17 years. We are a not for profit club with all our funds going back into the club and promoting junior rugby in the community. 2018 will be our sixth year and from a handful of kids we have grown to more than 400 children playing rugby and touch from a very wide catchment of local and international schools. In fact, we pride ourselves on the great mix of cultures and nationalities we have in each team. Many of our Academy coaches are drawn from the SCC adult teams and we have strong links with the SCC adult section. Look out for our 2018 SCC Academy Coaches Calendar where you’ll get to see our sporting coaches in a whole new light. The idea was borne after a long day and a few post SCC Academy 7s beers in the club. It’s proved a popular fundraiser for charity. We look forward to taking the Academy even further in 2018 with the SCC Academy 7s and the SCC7s very much the highlight of our rugby calendar.